Indications: Antihistamine prescribed to relieve allergy symptoms that affect the eyes, including itching and watering. Summary Recommendations: Optivar is prescribed to treat allergy symptoms that affect the eyes, including itchy and watery eyes. The medication should be used as prescribed. The prescribing physician may prescribe the medication off-label for other uses. General Precautions: Optivar is packaged and delivered to the eye in a dropper bottle. It is important to wash hands before using the dropper and keep the dropper clean and sterile at all times. Never touch the surface of your eye with the Optivar dropper. Contamination of the dropper can cause eye irritation and infection. Remove contact lenses before using the medication and allow at least 15 minutes before placing contact lenses in the eye. Do not use Optivar for the treatment of eye irritation associated with contact lens use. Common side effects associated with Optivar use include runny nose, temporary blurry vision, bitter taste, headache and mild burning or irritation of the eye. More severe side effects have been reported, including extreme burning and irritation, difficulty breathing, pain and fever. Report both mild and severe side effects to the prescribing physician. Allergic reactions to Optivar have been reported. If you feel you are having an allergic reaction to the medication, stop using Optivar and contact the prescribing physician. Effects While Trying to Conceive: Animal testing on Optivar at 25,000 times the human dose showed no effect on fertility. Optivar does not appear to affect fertility in a positive or negative manner. Effects on Pregnancy: There have been no studies on humans regarding safety in pregnancy. Animal studies at 25,000 to 57,000 times the human dose have caused fetal defects, including skeletal abnormalities and delayed ossification of bones. It is suggested that Optivar be used only when the benefits outweigh the potential side effects. 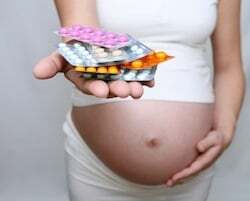 If you are using Optivar when you find out you are pregnant, information your prescribing physician of the pregnancy and tell the obstetrician about Optivar and all other medications you are currently using. Safe During Breastfeeding: Due to the extremely low dose and the delivery point (the eye), the amount of Optivar present in breast milk should be extremely low if detectable at all. There have been no reports of negative side effects in nursing mothers of breastfeeding infants. No human studies have been completed in regards to the safety of using Optivar while breastfeeding.